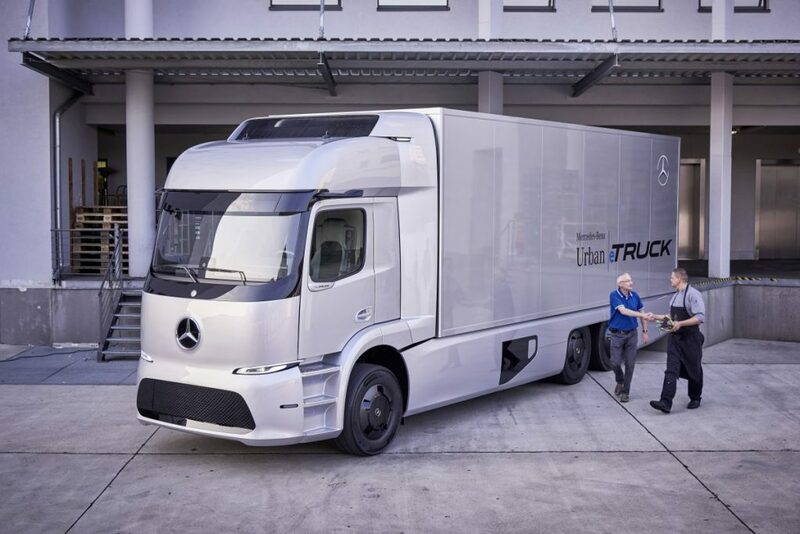 Daimler Trucks announced this week at the IAA 2016 commercial vehicle show in Hannover, Germany, its future urban transportation strategy, which includes the company’s first electric truck, the Urban eTruck. After introducing its electric drivetrain concept in July, Daimler continued the project with the introduction of the Urban eTruck, an all-new electric truck concept for short-radius, zero-emissions goods distribution. The eTruck has a 200-km range, or approximately 125 miles, on a single charge and has payload capacity up to 12.8 tons. According to Sven Ennerst, Daimler’s head of project engineering, the eTruck’s lithium ion batteries can recharge within two hours. The eTruck takes design cues from the Mercedes-Benz Antos cabover, but the electric drive eliminates the need for a conventional air inlet, which is replaced by a LED-backlit black panel grille capable of displaying battery charge status, truck operating status and more. Daimler also introduced the Mercedes-Benz Future Bus and announced its plans for an all-electric bus by 2018.